The first time I saw women holding Silent No More Awareness Campaignsigns, I was overwhelmed with contradictory feelings. “I regret my abortion”? Did I read that correctly? Aren’t these women ashamed of themselves? Then I felt the warmth of my own shame burning my cheeks followed by chills and tears. I had to face the truth: I should be with them! I am one of them! I am not being honest standing in the crowd with my husband, pretending I’m some kind of holy, cradle pro-lifer. I should stand with my sisters on the steps of our State House. I wanted to hide, I wanted to scream, I wanted to lie down on the floor and cry. I wanted to talk to them but they were in a different, inaccessible place psychologically. I was feeling angry at myself and at life in general. A couple of months later, I heard an abortion testimony in Church as part of a service dedicated to the unborn. The woman had two abortions just like me. I was shocked. I never knew that people actually shared those stories in public. I awkwardly thanked the courageous woman but I couldn’t speak. This article explains how I came to deal with my own abortions a couple of months later. Some people say: you had an abortion, so what? Why don’t you get over it? Why do you feel the need to share your stories? Didn’t Roe v. Wade settle the issue with the “right to privacy”? We can’t heal what we don’t acknowledge. Abortion takes our child’s life and we are expected to go back to our lives as if nothing happened. Burying our head in the sand won’t make the abortion go away. We are Silent No More because we were sold a lie. 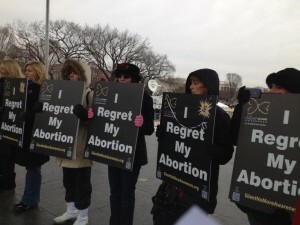 We are Silent No More because abortion hurts people physically, mentally and spiritually. We are Silent No More because in Jesus Christ, we are forgiven, we have forgiven ourselves and all those involved. The Silent No More family is a patchwork of mothers and fathers who have lost children to abortion but we are united by love and hope, not by grief and anger. Abortion creates complex emotions that need to be addressed and healed but some feelings never completely go away. Kelly Clinger wrote about her feelings after sharing her story. I can absolutely relate, especially after the March for Life last week (see Silent No More picture, I’m wearing a beige coat). This is a spiritual battle and this is why prayer is a big part of our ministry. Acknowledging our worst deed in public is a difficult thing to do but it is liberating for us and for those who relate to our stories. Freeing ourselves from our darkest secret transforms us. Each opportunity to speak the truth about abortion helps us to shed a layer of shame, allowing the secluded caterpillar to become a graceful butterfly. The metamorphosis is well worth the pain. Next Article Were Italian Journalist’s Blackmail Allegations Baseless?